The wait is over! Summer in Central Ohio will be even more exciting this year as Ohio Village will be open, once again, to visitors on the same days as the museum in the Ohio History Center ( June 2 -September 2). It’s been nine years since the village matched hours with the museum and explorers of Ohio history could enjoy two attractions for the price of one admission-- to the museum AND the Ohio Village. 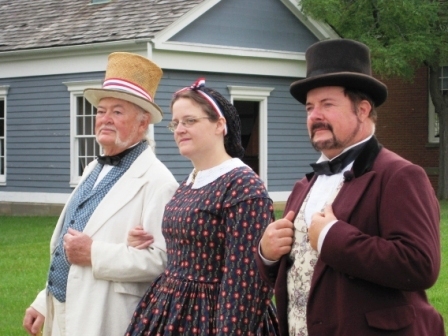 The village will be populated with costumed interpreters helping visitors to understand how people lived 150 years ago. Other activities like cell phone tours and Village Quest, a treasure hunt-style booklet promise to keep adventurers back in time while visiting the Civil War era town. Characters in the village will include Ezechiel Abraham Barrymore, the town’s undertaker and carpenter. Ezechiel can build a coffin for you or, if that’s in the far future, how about some furniture for your home? Then there’s Hiram Brown, the pharmacist. He is sure to have a concoction for whatever ails you. And don’t forget to stop by the lodging house and sit a spell with Mrs. Baugh. She has the latest gossip on all the residents, some of it true! Need a few dry goods? Stop in at the General Store where Mr. Watson can supply everything from fabric to nails. And you can pick up your mail there, too. In addition to the daily experiences of the Village, several Discount Days will take place on select Saturdays when half price admission specials will be offered. June 2 will be Senior Day for visitors 65 years and older. Scouting Day is June 16 for scouts, leaders and their chaperones. July 21 is Military Day for active duty and retired services members and their families. August 11 is Educator Day. While teachers receive free admission to the Ohio History Center, other education professionals and their families will receive half-off on Educator Day. Base Ball Day is September 1 for anyone, youth or adult wearing uniform, cap or shirts supporting their favorite team. Echoes in Time Theatre will take up residence in the Village every Saturday this summer at 1 p.m. and 2 p.m. And, on July 21, Civil War soldiers return to the Village for an all day encampment where visitors can learn about camp life. Plus, the Ohio Village Muffins vintage base ball team will play on several weekends. Details can be found at www.ohiohistory.org/village. Ohio Village is located just off of I-71 on 17th Avenue (exit 111) about four miles north of downtown Columbus in Franklin County. Summer hours: Wed-Sat. 10 a.m.-5 p.m. and Sunday, 12 p.m.-5 p.m. Visit www.ohiohistory.org to learn more.